In 2015 the SACN’s systematic review and meta-analysis demonstrated the importance of higher fibre intakes for better health outcomes. Following the report’s (Carbohydrates and health) publication, the focus turned to the detrimental impact of high sugar intakes whilst the fibre findings were absent from any health news headlines including the government’s. Additionally, body weight, systolic blood pressure and total cholesterol were found to be significantly lower in population groups consuming higher fibre intakes when compared to those consuming little fibre. The WHO review of the data was extremely thorough, analysing just under 190 prospective studies and 58 clinical trials. WHO confirms the SACN’s recommendation and consequent new government recommended dietary reference of 30g fibre daily for adults. An intake of 25-29g fibre was identified as the critical intake for improved health outcomes. The evidence was strongest for total fibre intakes and whole grains whilst glycaemic index evidence was classified as low to very low. There was a clear dose dependent response with no sign of a plateau – thus achieving even modest increases in fibre intakes would benefit individuals. This is highly important from a practical and realistic perspective. 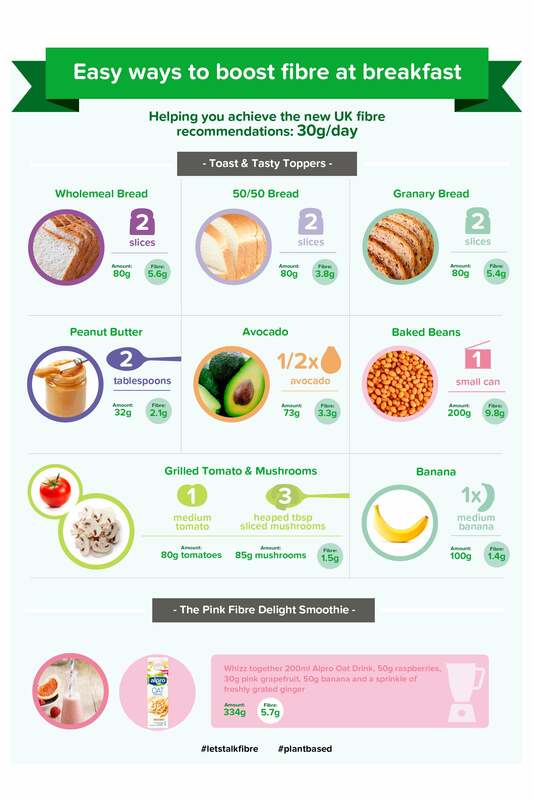 The UK population’s average intake is less than 19g fibre per day, making the 30g fibre daily intake recommendation hard to achieve in the immediate term. However, messages highlighting that even modest and achievable increases in intake would result in improved health outcomes is more likely to motivate individuals to increase their intake. Another confirmation that plant-based eating is the way forward for both health and the sustainability of the planet. In collaboration with leading experts in the field, Alpro has produced a number of resources for health professionals to update their knowledge on the science of fibre and practical resources to share with their consumers and patients. A comprehensive scientific review of the evidence for fibre and health outcomes by Dr Megan Rossi and Dr Eirini Dimidi from Kings College London. Watch the latest recording of Dr Megan Rossi's presentation on the 7th November. As well as covering off the scientific evidence for fibre and its association with health outcomes from mental to gut health, the webinar also provides insights into current UK and Irish fibre intakes compared to recommendations as well as practical tips on how we can help our consumers improve their intakes for better health outcomes. 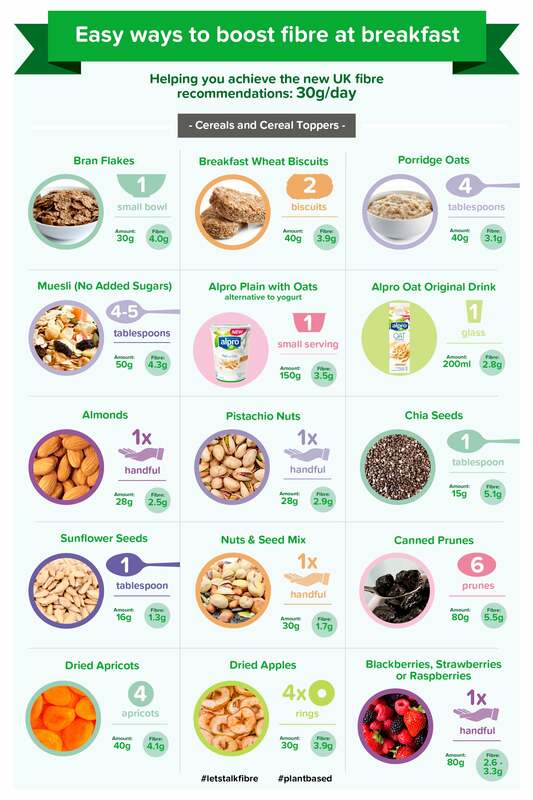 A visual practical guide on simple ways to significantly increase fibre intakes at breakfast time. The resources are available as downloadable pdfs and images to be shared on social media. The BDA launched it's Sustainable Diets toolkit for dietitians - One Blue Dot® (OBD®) in November 2018. The aim is to arm dietitians with all resources needed to help them lead on advising consumers on diets that are both environmentally sustainable and healthy. The key dietary manipulation is to increase our intake of healthy plant foods including whole grains, beans, lentils, nuts and seeds as well as fruit and vegetables. As a consequence, balanced environmentally sustainable diets - such as recommended by the BDA OBD®, provide significantly more dietary fibre than current eating habits and inline with WHO and SACN fibre recommendations.